Anyone who reads one of the four Gospels is bound to ask the question - What happened next? With Jesus Christ crucified, resurrected and ascended into Heaven we are left with a few men who not so long before scattered to the wind at the first sign of trouble. How did these men, with the help of the Holy Spirit, establish Christ's Church and begin spreading the Gospel? The book of Acts tells this story and this book will be a helpful introduction, giving you a good start in understanding the message it contains. 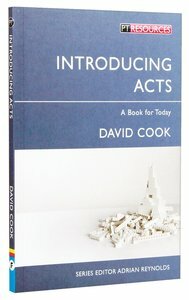 Designed to accompany the more extensive Teaching Acts (978-1-84550-255-3) by David Cook this short book will not take long to read, but will be a great help to all those seeking to understand the book of Acts better. About "Introducing Acts (Proclamation Trust's "Preaching The Bible" Series)"
David is a Presbyterian minister, having served in both Wee Waa and Ashfield. He is a graduate of Sydney Missionary and Bible College (SMBC) and Moore Theological College. Prior to formal studies and pastoral ministry David worked in the Economic Research Department of the Reserve Bank. He is the Director of SMBCs School of Preaching and speaks at Christian conventions throughout Australia and overseas. David lectures in preaching and pastoral subjects. He has recently written Teaching Acts and The unheeded Christ.